We are excited to present to you STEP UP! Be a Leader, Make a Difference, � an award winning (NASPA Gold) interdisciplinary resource that trains students to recognize problem situations involving their peers -- such as alcohol abuse, hazing, discrimination, depression, and many others -- and to safely and effectively act on them. This unique approach provides you a teaching tool that goes beyond traditional education about health and social issues; it truly empowers the learner to act upon their values to help others in need! STEP UP! materials were developed by the University of Arizona in partnership with NCAA Education Services, The BACCHUS Network , the University of Virginia�s Gordie Center for Alcohol and Substance Education, and other national leading experts. Information from student surveys is used to underscore the premise that students want to be leaders and intervene when appropriate, but many times do not feel they have the knowledge, skills and/or confidence to do so. By learning the 5 Decision Making Steps -- to notice the event, interpret it as a problem, assume personal responsibility, know how to help and implement the help -- students move from bystander to leader by means of tested, safe and effective intervention techniques. Specific action steps as well as local and national resources are included for each topic. The comprehensive Facilitator Guide includes an outline which details each step in the training, talking points, activities, worksheets, and much more. The student version of the book guides your students through a number of issues and scenarios for hands-on application to reinforce the curriculum content. The Step Up! program was originally created for student-athletes at the University of Arizona to address unique scenarios that today's student-athlete faces. If you are working with student-athletes, please consider purchasing the student-athlete Facilitator and Student guidebooks. For the same price, you'll get the added content. For more information about the STEP UP! program, please contact Becky Bell: bell@email.arizona.edu or visit the official website: www.StepUpProgram.org. For questions or problems related to placing an order, please contact Fast Copy, our university's printshop: fastcopy@email.arizona.edu. Q. Where is Fast Copy? A. We are located on ground level at the Student Union Memorial Center, 1303 E. University Blvd. A. Parking on campus is extremely limited when classes are in session. If you're lucky, there are three 20-minute parking spots on Mountain and 2nd Street. Otherwise, there is pay parking in the 2nd Street Garage across the street. Q. Can I take the streetcar? A. Yes! The Student Union is on the SunLink streetcar route! 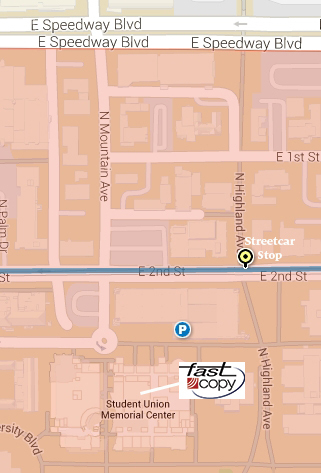 Get off at the Highland stop on 2nd Street and walk a short distance to the Union. Pick Up at Fast Copy: Monday - Friday, 8:00 am - 5:00 pmCampus Delivery: Monday - Friday, Morning deliveries Campus Delivery: Monday - Friday, Afternoon deliveries by 5:00 pmFedEx Shipping: Note: Will increase the cost of delivery.